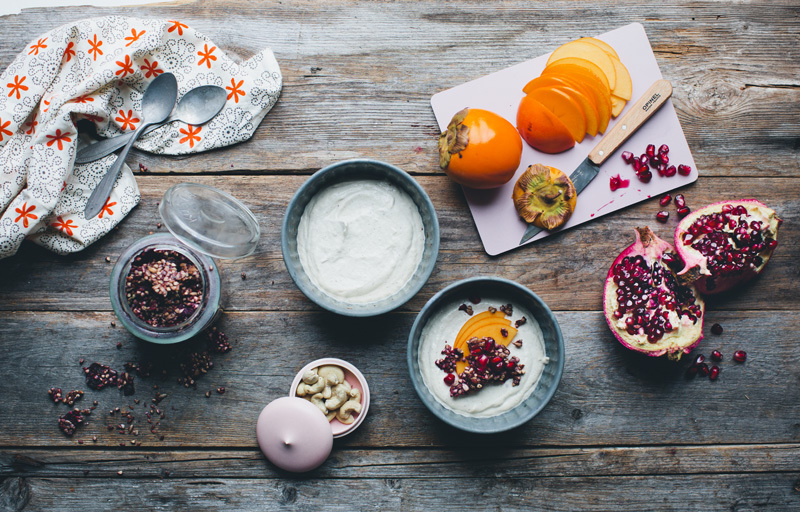 Raw Cashewgurt Bowl + News! Writing a cookbook was a new and rather chaotic experience for us, in many different ways. Hopefully we have learned a few lessons for this next one. Yes, there will be another one! And if everything goes as planned, it will actually be released already toward the end of this year – Autumn/Winter 2014. So as you might guess, we are right in the middle of the cooking-eating-recooking-shooting-process. The theme will be Food inspired from our travels, which is one explanation behind our frequent flights between the continents this past year. We have been inspired by vegetarian recipes from around the world and are giving them our personal Green Kitchen twist. Everything is being tried in our own home to make sure that they are easy accessible and completely doable in normal kitchens. We have already cooked up and shot a whole bunch of recipes that we are pretty excited about, hopefully you will think the same. It feels so wonderful to have been given the opportunity to write a cookbook that is so in accordance with how we cook at home; we rarely stick to one style or country, but jump from Scandinavian to Indian to American to South European food. We will share more details as we proceed and probably also see if there are any volunteering recipe testers out there. Stay tuned. Now on to today’s recipe. 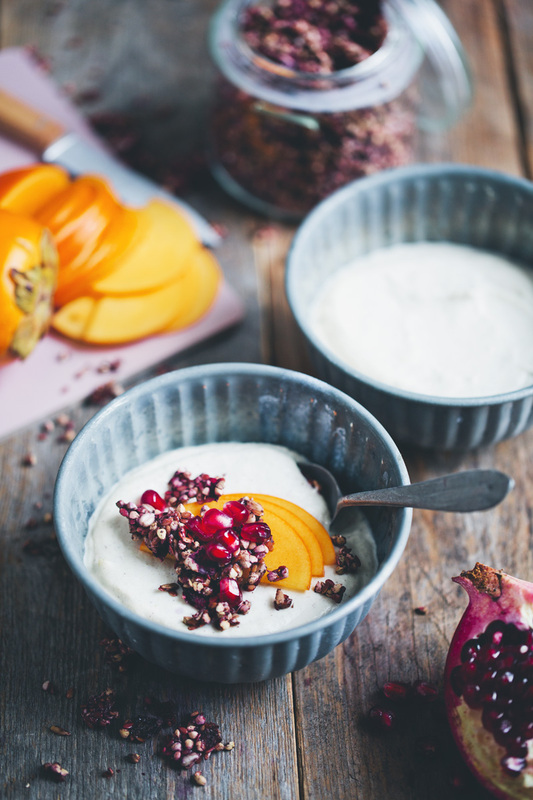 Since this is the first post of the year, we wanted to share something very fresh, delicious and hopefully new to many of you – a creamy and easy cashew ‘yogurt’ = cashewgurt. 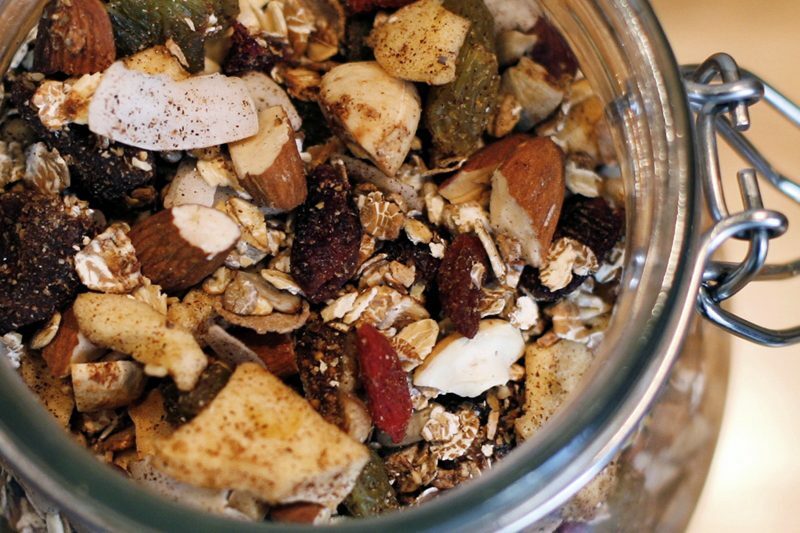 This is something you can whip up in a couple of minutes (given that you have soaked the cashews the night before) or make a larger batch, scoop into jars with topping of your choice and have yourself a portable breakfast any morning. This cashew treat is also perfect for serving at events/brunch/tea parties etc. 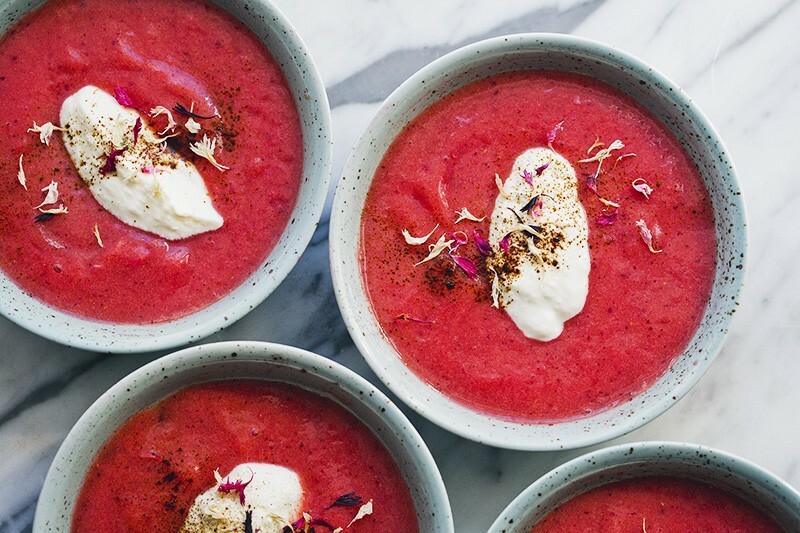 Scoop into small glasses, garnish with berries, place on a tray and see how many that can guess that this creamy treat actually is vegan. Inspired from a breakfast we had at Simple Raw in Copenhagen. An absolute must-visit when you are in Copenhagen. Combine psyllium husks powder and water in a small bowl and stir until it thickens. Place soaked cashew nuts in a high speed blender (or in a bowl and use an immersion hand blender). Add lemon juice, water, dates and sea salt and blend until completely smooth. Pour into a bowl and add 2 tbsp psyllium gel and stir to combine. Scoop into two serving bowls or glasses, chill in the fridge for 10 minutes. Serve with granola and fresh fruit. Note: The psyllium seed husks gel adds a very delicious creaminess to the yogurt that is kind of key to this recipe. You could make it without, but it won’t be as creamy. Psyllium seed husks powder is really affordable and is a good source of fiber and contribute to good intestinal health. You can find it at the supermarkets gluten free shelf, in health food stores or order online. 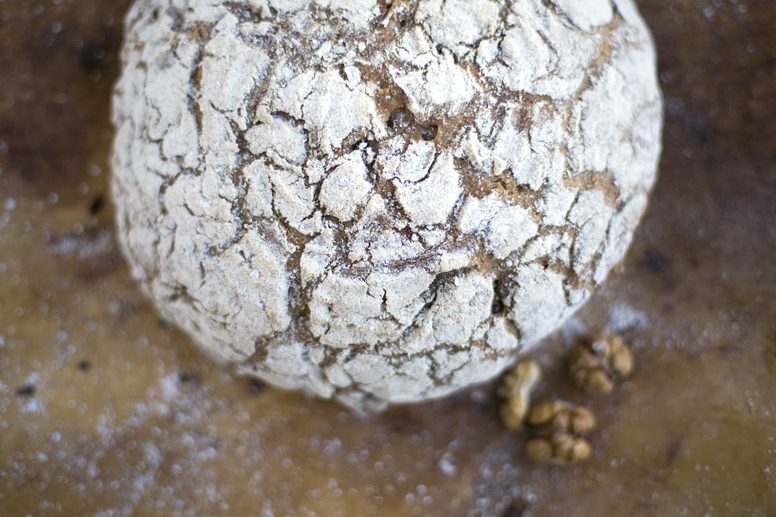 Use it in gluten free or egg free baking, like this Paleo bread recipe. 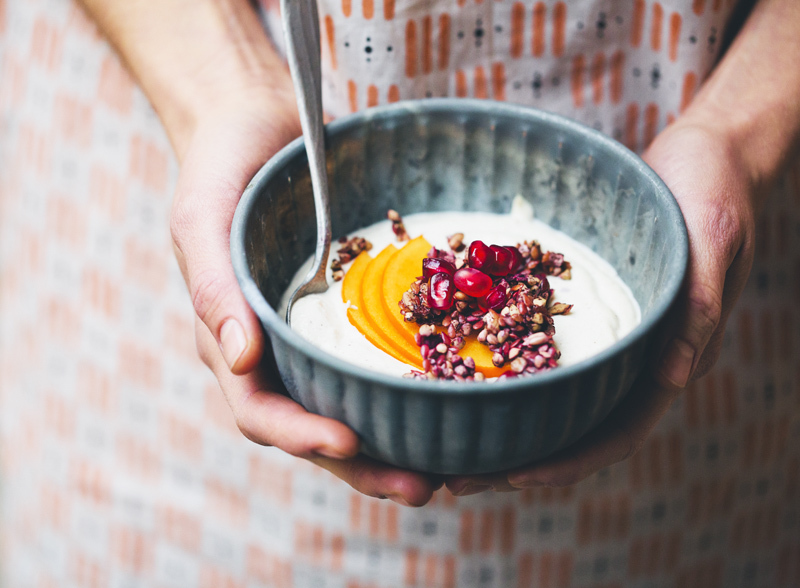 If you have digestive problems try adding a spoonful of psyllium husks gel in your morning porridge or smoothie for a few days and it’ll ease your digestion. Fantastic news! Love love love what you do. This is such exciting news! I've loved your first book and cooked from it with passion. Congrats! This looks so silky and mmm.. Do you think I could substitute grounded flaxseeds or agar-agar in stead of the psyllium? Good luck and loads of fun with the making of the cookbook!!! Oh thank you for the fast response. I'll definitely let you know when I tried out! I would think that chia seeds would work as well as a substitute since they get gelatinous when soaked (and also great for fiber, fatty acids and the like). I made the cashewgurt with the powdered flax. Actually I found it to have a nice texture already just after blending (I like my yoghurt thick), but was even enhanced (more silky and smooth) after adding the flaxwater and refrigerating. But I'm not sure what the difference would be in adding flax or the psyllium, or if the little amount of flax has even done anything at all :p. I found it to be very yummy and really satisfied my belly the WHOOOOLLLEE morning! Thank you for this great idea. I loved your first book, so can't wait to see the new one. I'm so happy for your cookbook success, the world needs your beautie and creativity with food. Great recipe, I heart cashews. What a wonderful and delicious way to start the year. 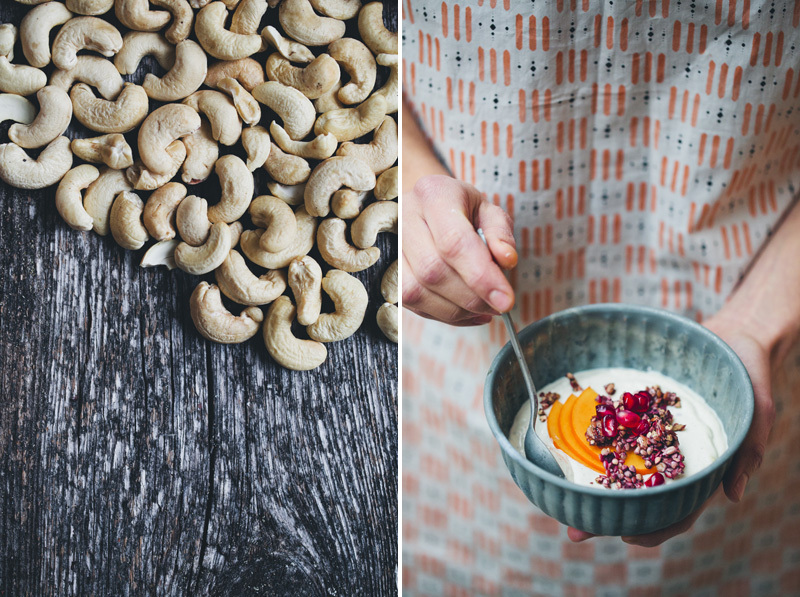 I love the idea of the cashewgurt (that we can try with other nuts). Since I have psyllium powder at home and I was looking for different way of using the persimmons and pomegranates that I have at home, I think I just found the perfect recipe. Will just add a pinch of cinnamon, that goes wonderfully with the persimmons :) Merry and delicious 2014! This looks divine! 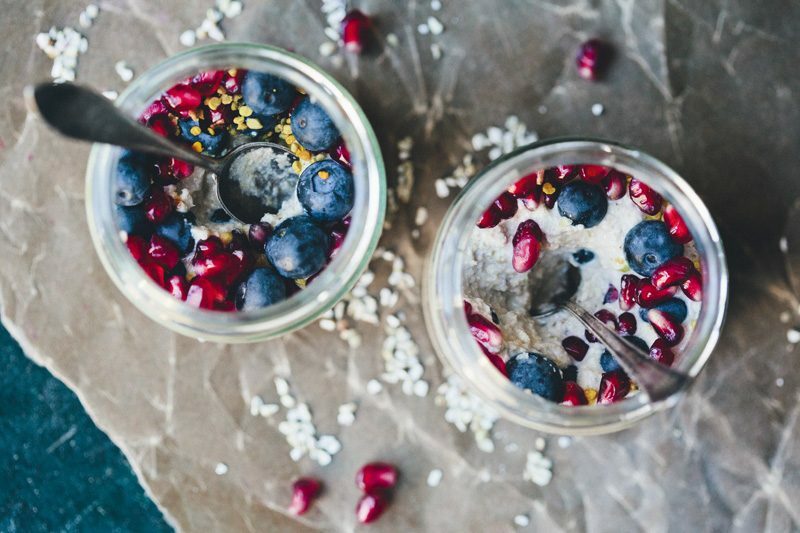 I have always wanted to dabble in cashew yoghurt/cream and this seems like a great way to start. I would looove to be considered as a recipe tester....my blog leans towards Indian food but would be happy to test anything. This is so cool! I can't wait to try it. And of course, congrats on the new book! Congratulations! I saw on Instagram that you were writing a new book but didn't think it would be this year! I am so excited to see it and try out the recipes. The cashewgurt looks so good. I've finally bought a vitamix so will trying this recipe out soon! Congratulations on the new book! I look forward to reading it already! I love the concept (like you I cook dishes from all over the world and would struggle to limit myself to one region's dishes) - amazing you get to travel this much for the book, I am sure it is a lot of work but it must also be incredibly inspiring! 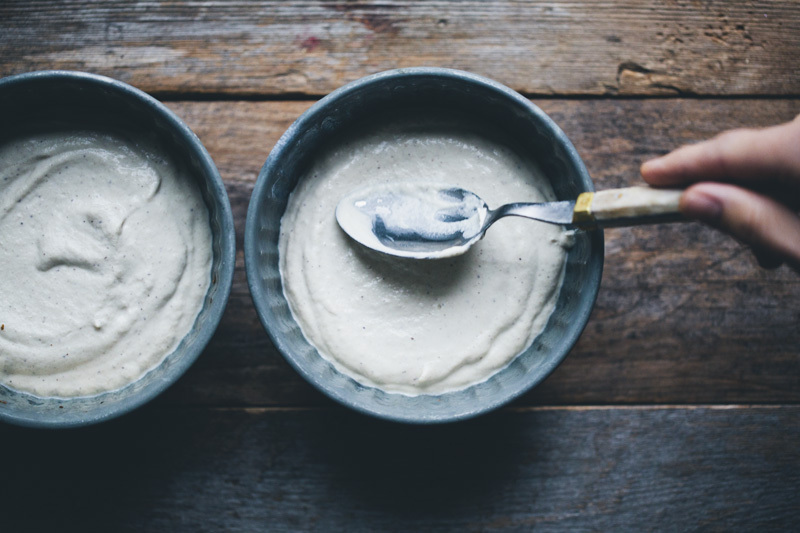 I love cashew cheesecake but have never tried cashew yoghurt - I need to invest in a new mixer soon and maybe, just maybe, I will finally splurge for a Vitamix which I think would help a lot with this recipe and many others! Are psyllium husks different to psyllium powder? Congrats! I actually made a cashew cream yesterday. It's yummy but not asyoghurty as I would have liked but certainly delish, especially when frozen like ice-cream with cacao nibs! I used chia to help give it some texture but I will definitely try your recipe next time! Congratulations!!! Well deserved! This cashwergurt looks amazing too.